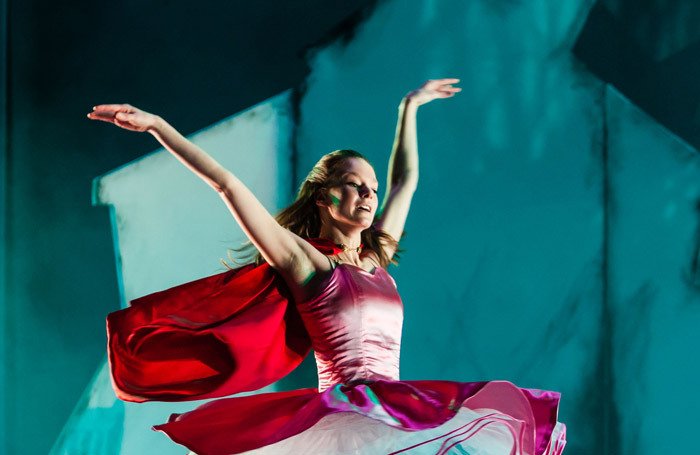 Spirited young company Ballet Cymru celebrate the centenary of Roald Dahl’s birth with two lively tales from Revolting Rhymes, the Cardiff-born storyteller’s collection of re-imagined fairytales. Both adaptations, Little Red Riding Hood and The Three Little Pigs, honour Dahl’s penchant for parody and the grotesque. Paul Patterson’s score is free-ranging, bright and buoyant, with comic touches of Beethoven, snatches of swing and a resounding brass flatulence for the wolf, his tail raised perkily, post-consumption of grandma. The latter (vigorously played by Robbie Moorcroft) isn’t a sweet old nana, but a coarse drunk in soiled skirts and a bonnet who lurches about to an off-kilter waltz. Her house, decorated with booze bottles, is conjured up by a simple, jagged pair of walls, complemented by a foliage-printed backdrop. Anna Pujol is a charismatic Red Riding Hood, rounding off her high-kicking phrases with triumphant little fist pumps and a sassy stance. Steve Denton has fun with the costumes – Riding Hood’s capacious bloomers conceal the pistol with which she dispatches both lupine villains, and by the time she’s called upon to help flamboyant, flamenco-stomping Spanish pig Senor Puerco (Miguel Fernandes) she’s morphed from pink-frocked girl to vampish moll in a cerise shower cap, hips wiggling with glee at the prospect of some more sharp-shooting. Among a range of fine comic performances, Gwenllian Davies catches the eye both as prissy, prancing tweed-clad pig Miss Twix and as a gormless sheep in a bobble hat. Overall it’s a fitting tribute to Dahl’s darkly comic creations.